When we reached the summit of Old Blue Mountain, Red went to search for a cell phone signal. 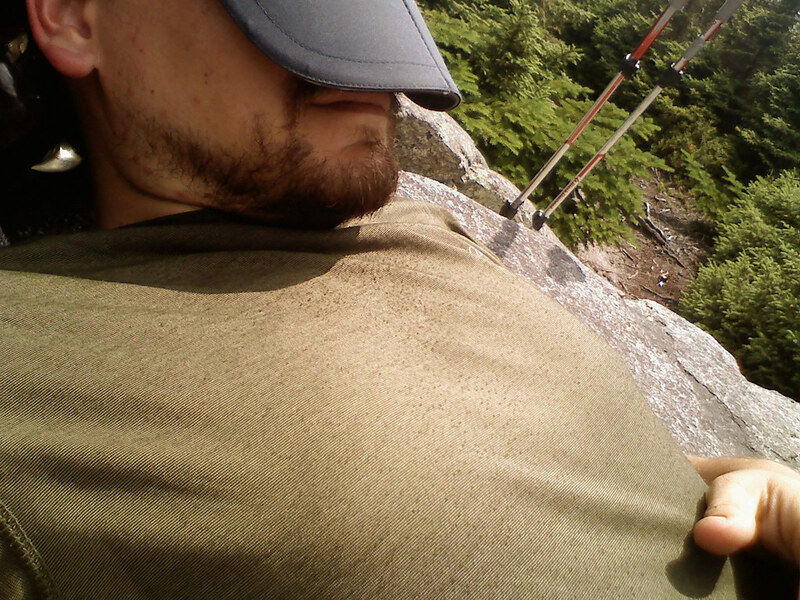 I found some exposed bedrock surrounded by spruce trees and laid down on my back. The sun warmed the bedrock all morning and now beamed in my eyes. I pulled my hat over my face. I was nearly asleep when I heard a familiar thump coming up the trail. “I could hear those heavy boots of yours fifty yards away,” I said then put my hat on and sat up. “That’s why they call me Thumper,” she said. Thumper loved her big Gortex boots that laced above her ankles. They must have weighed three pounds each, but she asserted that they would shield her from snakebites. Even though she was petite, the rugged boots matched her truer character, a kind of toughness or fortitude. By this point in the trip, both she and her boots seemed bulletproof. Bambi reached the peak next, then moved on ahead. Her backpack, which always seemed to weigh as much as she did, disappeared into the pines, followed by Thumper then Red. We may have reached the summit before Bambi, but she was hard to catch on these steep descents. 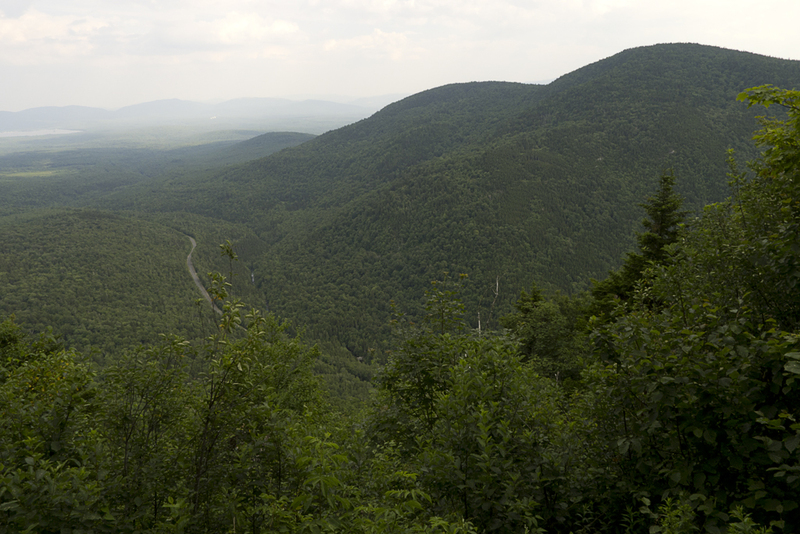 Halfway down the mountain, the trees opened up to reveal the only sign of civilization for miles, a lonely stretch of road cutting through the dense trees in the valley. We needed a hitch to Andover to resupply, but the road looked seldom used. I finally caught up to Bambi at the road. She was waiting by a car parked on the shoulder with the others. 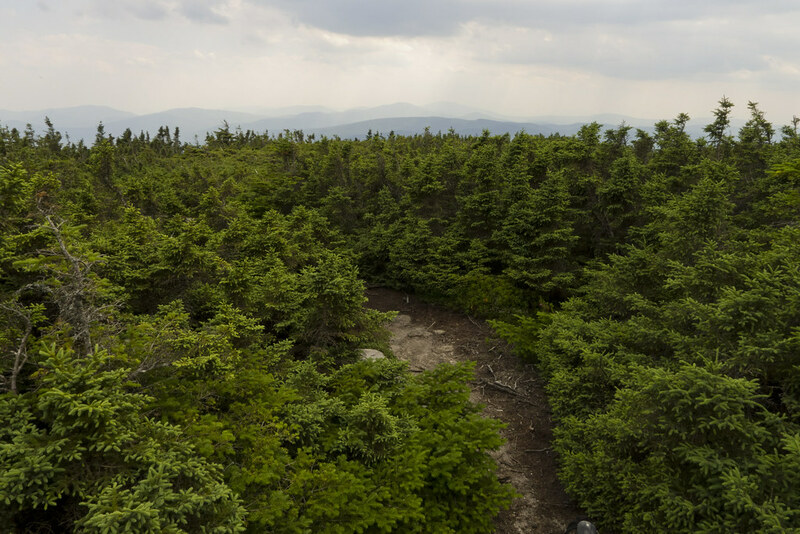 “The day-hikers we passed said they would drive us to Andover,” she said. This was great news. I loved spending night after night in the forest, but since we never had a plan, much less a reservation, the towns were always a mystery. When I left home for Maine, I expected to spend most of my trip alone. Then I met Red on the bus to Bangor and we met the girls on our second day. We hit it off quickly. I'm not a social person by nature. I've never been that great at making new friends and I rarely get close to anyone, but the trail's ability to attract like-minded people helped free me from that. 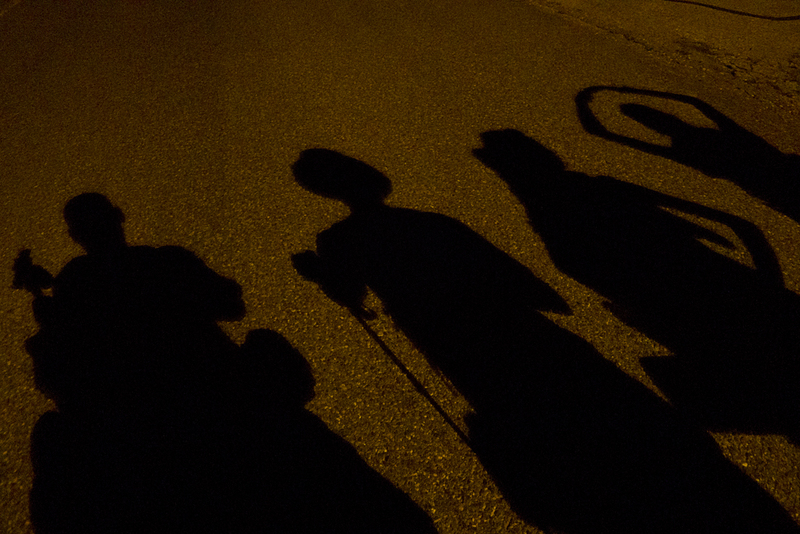 We could gush about any aspect of the backpacking life and know we all understood each other. I miss that a lot, that connection with people. I imagine it's a lot like how those introverted Bigfoot enthusiasts feel when they walk into a Bigfoot Hunters Convention. On the morning of that second day, before meeting the girls, we stopped to buy food at the Abol Bridge camp store, the final place to pick up supplies before entering the Hundred Mile Wilderness. 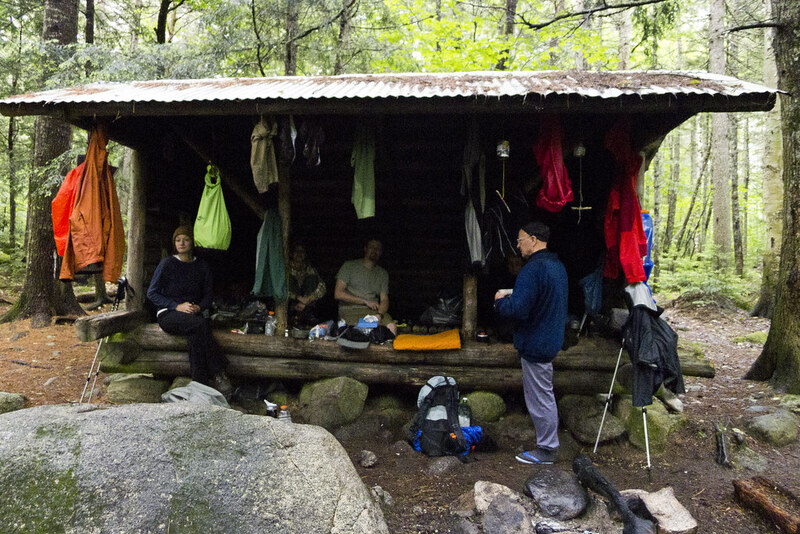 “You fellas heading to the Hurd Brook Shelter for the night?” an older hiker asked. 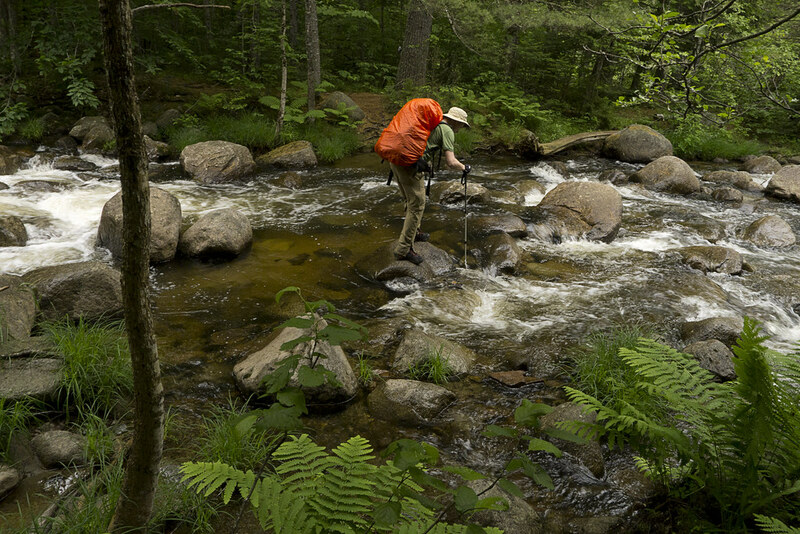 The sixty-something man had one more day on the trail before finishing a multi-year section-hike of the entire AT. “Yeah, that’s the plan,” Red said. I wouldn’t know until later that he was talking about two people I would share some of the greatest months of my life with. Two people that I would soon care about as much as any lifelong friend or family member. I can’t point to a single moment when I started to feel that way, but when I reflect back on it now, I think of a specific moment Andover. When the day-hikers who offered to drive us into Andover got to the road, we piled our gear into their car’s hatchback and the four of us squeezed into the backseat. We hooked arms in case a door decided to pop open. When we told them we were hiking all the way to Georgia, they asked, “Why? 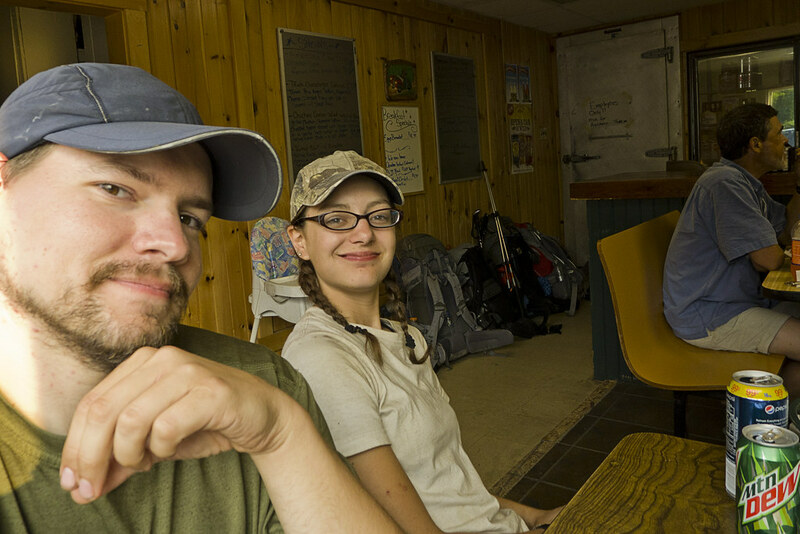 Are you from the south?” They weren’t the first to ask us that, as though being from the south made sense of why we would hike a two-thousand mile trail through the Appalachian Mountains. It seemed like asking a skydiver, "So, why are you jumping out of this plane? Your house down there or something?" They dropped us off in front of the Andover General Store. We thanked them for the hitch and offered the obligatory apology for the hiker smell. The small mountain town didn’t have much other than the general store, but that was enough. There was an ice cream stand next door. Inside were shelves lined with essential junk foods, coolers of soda, and a deli that served short-order foods. In the back sat a diner-style bar and a few tables topped with sweeteners for coffee and stacks of assorted jellies. 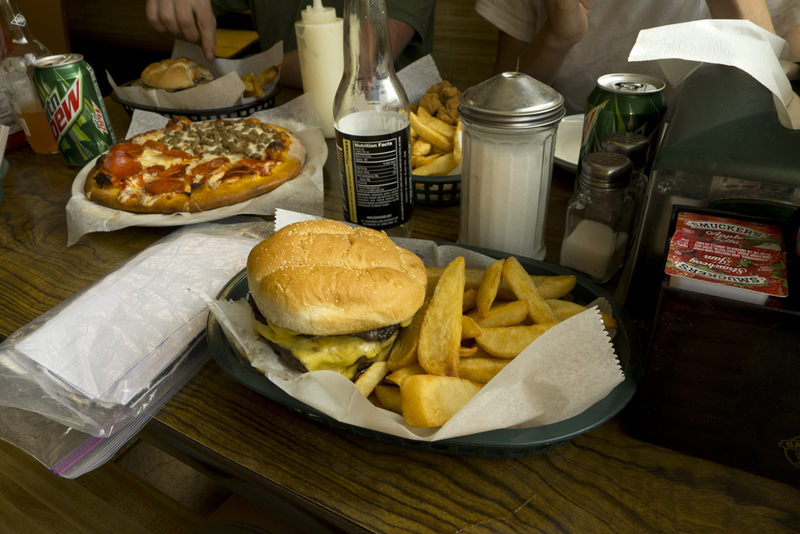 A chalkboard advertised the triple cheeseburger with fries as the current special. In other words, every thru-hiker necessity. We propped our packs against the back wall and sat at a table. I remarked about people asking if we were from the south and Thumper suggested that, while in Andover, we should start saying yes, in ridiculous southern accents. This prompted another trail name change. I went from Cam to Nathaniel Hawthorne III, a native of Tallahassee, but no relation to the literary giant. I don’t know why. The name just flowed off my tongue when I started speaking with that Tallahassee drawl. While we waited for our server, we asked Thumper to tell us one of her folksy tales. As a proud Kentuckian, she used her best Southern Kentucky accent. “It’s always sad when they die like that,” I said with what I hoped sounded like a Tallahassee drawl, but my knowledge of that accent came mostly from slick Florida politicians in movies and Foghorn Leghorn cartoons. “Yeah 'specially when they just up, and die,” Red said. “Right, when they up, and die.” I said. “How’d she git up and down that hill?” Red said. “Whew, sounds like she's a talkin' trash about Mobile, Red.” I instigated. “They're the same thang,” I lied. “Oh yeah?” she said, playing along. We kept our accents for two or three days before one of us broke character. Even weeks after Andover, we slipped back into them involuntarily. “I guess we’re prolly annoying the hell outta everyone around here,” Red said. “Oh we prolly sound like a breath’a fresh air in here,” Thumper said. “A breath’a fresh air indeed,” Red said. “Up here in Maine they prolly don’t get many folks like us. I mean, I’m from Mobile and we got Tallahassee over here." “And good ol' Kentucky girls!” Bambi said. “That’s right, yee haw!” Bambi said. “How you doin'?” Red said to the waiter who came over to set silverware wrapped in napkins on our table. "I'm from Mobile,” Red said. It must have been an incredibly long time if he thought Red’s accent sounded authentic. I thought his accent had more of a “mentally challenged New Yorker pretending to be from the south” sort of quality to it. When he talked to people with his accent, they seemed to be thinking, "I don't know what it is exactly, but this boy's not right." “Thank ya,” Red said to the waiter. After eating a table full of triple cheeseburgers and deep-fried foods, we began to wonder where we were going to sleep. We asked one of the servers if she knew of any places that wouldn’t lead to our eventual arrest. We thought maybe she would invite us over to her house. It wouldn’t be the first time such a trick worked for us. She just suggested a field up the road out of town, so we left without a plan. Red stopped at the ice cream stand for dessert. We hung back to wait for him. "Alright, well, I was up in mah room on daddy's farm in mah purdy navy blue cotton dress," Thumper said. "An' all a sudden, daddy yells, 'Girls, git yo' shoes on!'" Meanwhile, as Thumper told her story, a girl walked up to take Red’s ice cream order. "You want that on a cone or in a cup," she asked. "Can I git that on a plate?” Red asked. “I’m so'ry. I'm from Mobile. That's just how we do it in Mobile." Her glared proved our assumption that we annoyed the hell out of everyone around us. I don’t know what her problem was. We thought we were hilarious. "So there I was,” Thumper was saying. 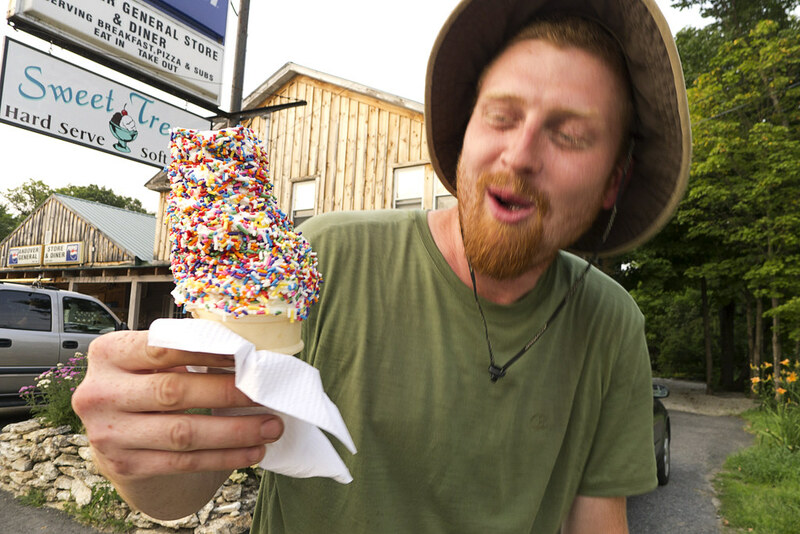 “In mah purdy navy blue cotton dress, tryin’ t'usher a two-thousand poun' heifer this-a-way into a barn,"
Then Red showed up with a tall soft serve ice cream cone covered in rainbow sprinkles. He took a huge bite out of the top. "Boy, you'll be shittin' rainbows fo' a week!" Thumper said. Our search for a place to sleep wasn’t as successful as it had been in other towns. We walked up the road out of town, but couldn’t get a hitch back to the trail. We cut through the field our server told us about to get to a patch of trees on the other side. We picked wildflowers to garnish our hair, just because, and suddenly we were dive bombed by mosquitoes. After a few minutes of relentless biting, we gave up on that area and walked back into town. The sun set as we strolled between rows of houses. I’m not sure what we thought would happen. Maybe we would start a conversation with someone taking out their trash and they would invite us into their home for the night. Or perhaps we'd find an abandoned building to crawl into like wild raccoons. Under a full moon sky full of stars, we stopped at a city park that consisted of a baseball diamond, an old metal swing set, and a wooden playset with a plastic yellow slide. We stared up at the rainbow-colored canvas roof above the slide and contemplated squeezing together on the four foot square platform. “That can be plan B,” I said. “How ‘bout that’s plan F,” Thumper said. We walked across the baseball diamond to the dugout least visible from the road. We dropped our packs as if we were planting flags in newly claimed territory. We lined up along the bench happy to have found a home. The full moon lit up the baseball field in front of us. We chatted in southern accents while passing around a plastic soda bottle full of whiskey. "Well I guess we’ll hafta change yo’ trail name to Two-Face." Thumper said. “People would be like, 'so why do they call you uhh...', then they'll glance up at my half-slacked face, quickly look down at their feet, and say, ‘uhh, why do they call you Two-Face?'" “Hah, that’s a belly-rumblin' knee slapper right there,” Thumper said and took the bottle Red handed her. "Man, I would do anything for a joint right now," Red said. "Oh yeah? Would ya wrestle a bear?" Thumper said. "Would y’usher a two-thousand poun' heifer into a barn?" Bambi said. We started to unwind, but we weren’t ready for sleep. At one in the morning, I invited Thumper onto the field for a game of invisible softball. 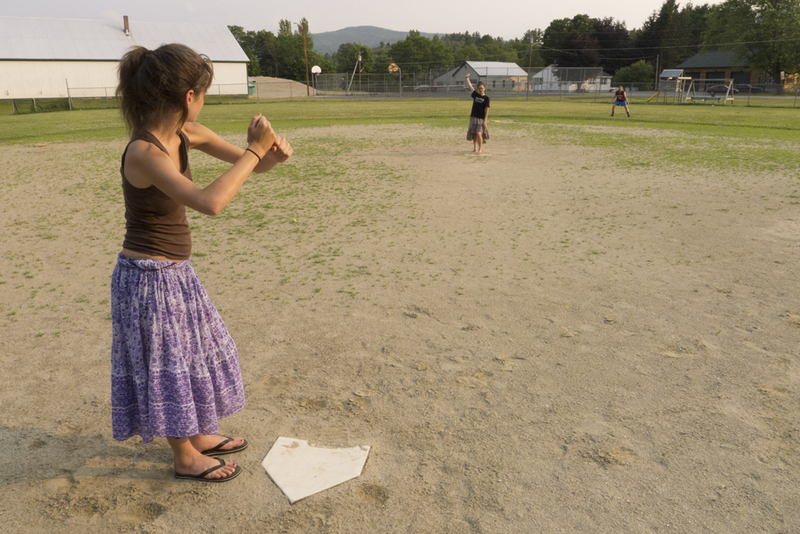 “How do ya play invisible softball?” she asked. “Well, it’s just like regular softball, ‘cept we don’t have any ah them bats, balls, or gloves,” I said. I jogged to the pitcher’s mound. Thumper was first at bat. I held the invisible softball up to my face with both hands, and peered over at Thumper taking a couple practice swings. I nodded at my invisible catcher then whirled the ball around and threw it underhand toward home plate. Thumper swung the invisible bat and cracked the invisible ball deep into center field. I sprinted after it. Thumper ran toward first. I reached down to snag the ball, fumbled it a bit, and saw Thumper rounding first toward second base. I bolted to tag her out. It would be close. Thumper slid boots first into the base. I looked at the invisible umpire, a portly man with chewing tobacco tucked in his lower lip, I assume. “Safe!” he yelled. Actually, I yelled. “Oh come on, ump!” I protested. Thumper stood up triumphant, but looked down at red lines scratched into her leg. That intensity would eventually lead her to the first invisible softball victory in history. A car engine rumbled. Our heads snapped toward the sound and we saw headlights coming down the road. “Get down!” I said. We dropped to the ground and laid flat on our stomachs in dewy grass mixed with baseball diamond gravel. The car parked in front of a house across the street. The driver turned off his engine then headed inside. We stood up and brushed off tiny bits of gravel that clung to our skin. After my turn at bat, Red and Bambi finally understood the glory of invisible softball and walked out onto the field. Red joined my team in the outfield, Bambi joined Thumper's and got up to bat. Bambi hit a long drive deep into right field. Red sprinted toward the fence, leaped into the air to catch the invisible ball then slammed into the fence. But it was too high for him to catch it. The girls won. After our defeat, we headed back to the dugout. I pulled out my journal to jot down all the memories for the day I didn't want to forget. When I finished I took the liberty of using my pen to write, “I heart Cam,” onto Bambi’s leg. On mine, she drew a smiling sun rising behind a fluffy cloud that read, “I heart Bambi.” Then she drew a fox in a tuxedo with a top hat and cane, and then a tree and mountains in the background. Thumper sat on my other side to watch Bambi create her masterpiece. By the time she finished I had a collage of random trail-related drawings covering my right leg. 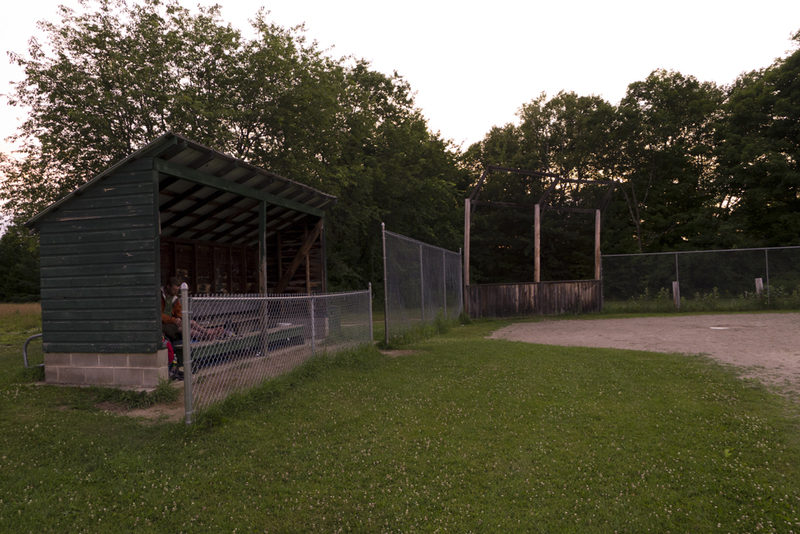 By three in the morning, we were understandably exhausted and the dugout grew silent. The girls rested their heads on my shoulders and I put my arms around them. "Well, with all that lemonade money, we never had to do mucha anythang. We just sat in our rockin' chairs, on our front porch, sippin’ that ice cold Tallahassee-style lemonade." “Oh it was,” I said. We sat huddled together like that for a while. Above the baseball field, clouds drifted under the bright full moon. We stared at them hypnotically until we were almost asleep. As I said earlier, I can't point to a single moment when the girls became like family to me, but when I reflect back on it now, I think of this specific moment in Andover.